Airport security is an important aspect to consider when preparing to board a flight. Getting through the Transportation Security Administration (TSA) screening process doesn't have to be a hassle, but there are important requirements to keep in mind when you are packing and making your way through the line. Things can go very smoothly, but only if you know--and comply with--the regulations and procedures. When you're traveling by air, it's important to consider what's involved with clearing airport security when packing your luggage. The first step in getting through TSA screening is to be sure that your carry-on bags are not too large. Each ticketed passenger is allowed to take up to one personal item (that will fit under an airplane seat) and one carry-on suitcase on the plane. If you get to the security line with too many bags or ones that are too large, you will have to check them. For most major U.S. airlines (Delta, American, United, Jet Blue and others), carry-on bags can't exceed 22 x 14 x 9 inches. A few U.S. airlines (Alaska, Frontier and Southwest) allow slightly larger bags. Some international airlines have either more stringent size restrictions or a total linear size limit (45 - 46.5 inches). For the major U.S. airlines, there isn't a specific weight restriction for carry-on luggage; the size is what is critical. Some international carriers do have weight restrictions, varying from 15 - 35 pounds. Personal items must be significantly smaller than a carry-on suitcase, though there is less common agreement among airlines regarding specific dimensions. For example, United Airlines limits personal items to 9 x 10 x 17 inches while Alaska Airlines simply gives examples of appropriate items, stating that passengers are "allowed one carry-on bag plus one personal item, such as a purse, briefcase or laptop computer." Verify restrictions directly with your airline. Any bag or other item that is too large to carry-on must be checked. Even though you don't carry your checked baggage through TSA with you, it still goes through screening before being loaded on the plane. This means that you should not lock your bags before check-in unless you use a TSA-approved lock. These locks have special codes that allow TSA and other security representatives to quickly and easily open them. If you place a different kind of lock on your luggage, security has the right to cut it off for inspection. This, of course, destroys the lock, leaves the suitcase unprotected for the flight, and can cause your bag to be delayed. Of course, what you put in your luggage is just as important as selecting carry-on bags that are an appropriate size. TSA has very specific prohibited item restrictions, and you need to know what they are before you pack. All bags will go through electronic screening and many will be searched by hand. Don't try to "get away" with carrying items that are prohibited. Visit TSA.gov for a complete list of restrictions for carry-on and checked luggage. Liquids: You may have one resealable quart-sized bag filled with containers of liquids, gels and aerosols (such as toothpaste, shampoo, lipstick, nail polish, and hairspray), as long as each individual container is no more than 3.4 ounces. Any larger containers with liquid or gel must be packed in your checked luggage. Food: You can carry a small amount of food to consume on your flight. Liquid or creamy foods such as yogurt, dip, and soup are limited to 3.4 ounces or less. Fresh fruit is allowed, as are pies and cakes. However, be mindful of any import restrictions when traveling internationally. Check with your destination country's food and safety regulatatory agency. Beverages: You cannot take beverages through security with you--no bottled water, soda, etc.-- unless you are traveling with young children. Passengers traveling with babies and toddlers are allowed to carry on breast milk, formula and juice. These items are not limited to 3.4 ounces, though they may be subject to X-ray or visual inspection. Sporting goods: You cannot carry most types of sporting equipment onto the plane. Skates (both roller and ice) are allowed, but that's it. You can't carry pool cues, baseball bats, golf clubs, or martial arts supplies. Tools: The only kinds of tools you can bring onto the flight are wrenches, screwdrivers and pliers, and these are limited to seven inches. Firearms: Absolutely no firearms or shooting supplies can be carried on an airplane. With specific limitations, passengers are allowed to "transport unloaded firearms in a locked hard-sided container as checked baggage only." Smoking supplies: Passengers are allowed to take lighters, one container of safety matches and electronic cigarettes in their carry-on luggage. Electronic cigarettes and matches are not allowed in checked bags. Lighters can be checked only if they do not have fuel or are enclosed in a case approved by the Department of Transportation (DOT). Blades: You can carry on a disposable razor, but no other item with a blade or sharp point can be carried on an airplane, though these items can be in checked luggage. This restriction includes scissors, box cutters, meat cleavers, and all knives. In 2013, TSA briefly lifted the pocket knife restriction, but quickly went back to banning them. Many airports are now participating in the TSA PreCheck program, which allows people who have been through a specific screening process to enjoy expedited boarding procedures. Participating airports will have separate lines for travelers who have TSA PreCheck status. These lines are typically shorter and move faster, but you can go through them only if your boarding pass is marked with the TSA Pre✓ symbol. Do not get in this line if you should not be there, as you will not be allowed to pass. 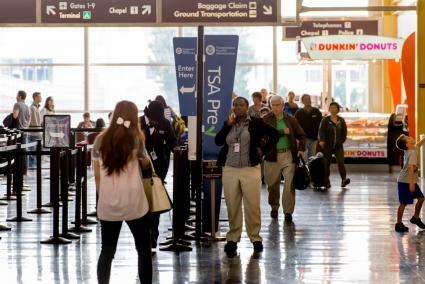 If you travel frequently, you may want to consider going through the TSA PreCheck process, as it can definitely help expedite check-in and airport security. For example, passengers who have this status don't have to take off their shoes, remove their jackets, take out their bag of liquids or remove their laptops for screening. All travelers over 18 must present proper photo identification (ID) prior to being allowed to go through the TSA screening line. They must also have a boarding pass in their name. Children under 18 don't have to present ID if they are traveling with an adult. If a child is traveling alone, you should contact your airline prior to departure to verify documentation requirements. Before proceeding to the initial TSA checkpoint, make sure you have your ID and boarding pass within easy reach. It's best to take them out and hold them while you are standing in line so they are ready when you proceed to the TSA agent. Hand both documents to the agent as soon as it is your turn to avoid causing a delay to yourself and passengers behind you. Double-check the expiration date on your identification documents well in advance of your departure date, as expired documents are not valid. You will not be allowed to travel if you present an expired driver's license or passport. Be sure to get your boarding pass before entering the TSA line. You can print it at home, print it at an airport kiosk (at most airports) or get it from the airline's check-in counter. If you have connecting flights, you do not need to show all of your boarding passes. Only give the TSA agent the boarding pass for your first flight so he or she doesn't have to shuffle through several papers to find what is needed. Have a plan for putting the documents away as soon as the agent is finished with them so you don't hold up the line by fumbling around figuring out what to do. Once you have been cleared to go through the screening line, move forward and begin situating your items for the X-ray machine. There are a few exceptions for young children and senior citizens. For example, kids under 12 and senior citizens don't have to take off their shoes or jackets. 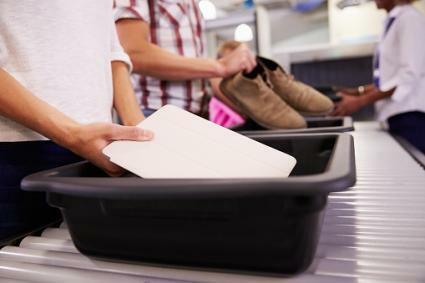 Place your plastic containers, luggage and any oversized items (such as kids' car seats or strollers) on the conveyor belt and follow the TSA agent's instructions. Items that are too large to go through the conveyor belt, as is the case with some kids' items, will be visually inspected by a TSA agent. Depending on what shows on the X-ray, agents may need to open and search your bags. If you have any prohibited items, those will have to be removed before you can board the plane. If the airport has lockers, you can rent one to hold the items until you return. Otherwise, you will need to discard any prohibited items. All travelers must be screened before being cleared to board, including children and senior citizens. While your luggage is being scanned, you will need to walk through a metal detector or advanced imaging technology (AIT) scanner. This process generally goes by quickly. Wait for the TSA agent to motion you in, then move quickly into the device. Follow the signs or agent's instructions. You will need to stand in a designated area, then extend your hands above your head. The machine will run a quick scan and you'll be instructed to exit and wait while an agent verifies the results. Depending on scan results, the agent may need to use a wand or pat-down for further detection. Cooperate as requested. Do not argue with the agent or become difficult. This will only slow down the process. Keep in mind that their goal is to ensure everyone's safety, including yours, and there are procedures they must follow. Once you have cleared, you will be instructed to move to the luggage line. Note: Passengers may request to opt out of being scanned in favor of a physical search. Per Department of Homeland Security (DHS) regulations, such requests are not always approved. Once you and your luggage have been screened, you can gather your belongings and proceed to the gate to board your flight. That's all there is to it! For people who don't plan properly, the TSA screening process can be an ordeal, both for themselves and everyone behind them in line. Follow these tips and you won't be responsible for causing avoidable delays the next time you go through security at an airport. The other passengers will thank you!